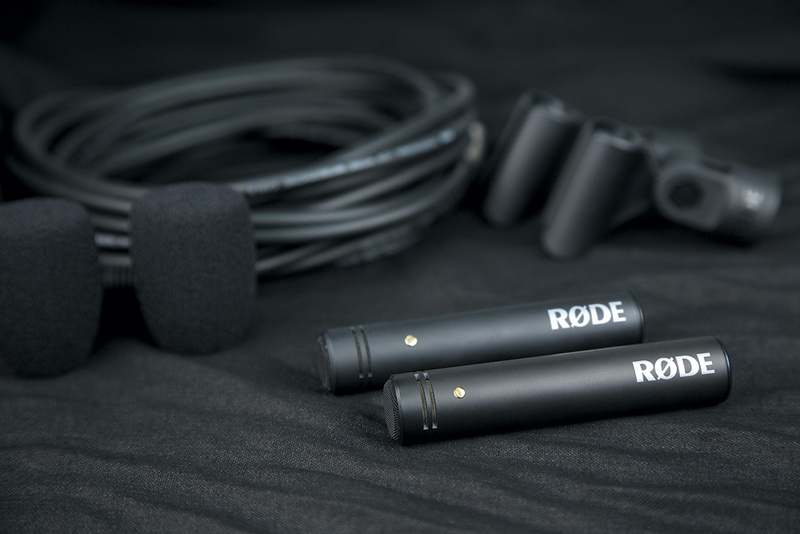 Rode's small-diaphragm NT5 and NT55 models have proven to be very popular in both project and pro studios, though for the past few years the company have been enjoying large-scale success with their video camera microphones, broadcast microphones and some more consumer-style products. Now they have turned their attention back to the project-studio market, with the launch of the new model NT1 large-diaphragm capacitor and the small-diaphragm M5, reviewed here. With the aim of delivering similar quality to the NT5 but at an even lower price, Rode adopted back-electret technology to develop this new end-fire model. Designed and manufactured in Australia, the M5 has a half-inch capsule with a fixed cardioid pattern, and Rode promote its key attributes as being low noise and a wide frequency response. Such small-diaphragm microphones are often the best choice for recording acoustic instruments or ensembles and choirs. Since many of these applications require stereo pairs, Rode are presently only selling the M5s in matched-pair sets. They ensure that there's a variation of no more than 1dB sensitivity between any matched microphones. Externally, the microphone employs Rode's proprietary matte-black ceramic coating, which is both durable and attractive. As supplied, the mics come with WS5 foam windshields and RM5 stand mounts, all packaged in a sturdy cardboard box with a form-fitting cardboard tray holding the mics and accessories. There's no plastic storage pouch. Internally, the circuitry employs a J-FET impedance converter feeding a transformerless, bipolar output stage, making good use of surface-mount components to keep things compact. The 20Hz to 20kHz response exhibits a subtle, wide presence hump of no more than a couple of dB centred at around 7kHz, but other than that, the response is sensibly flat until it hits the -3dB points at 20Hz and 20kHz. There are no pads or filter switches on the mic, though it can handle SPLs of up to 140dB (at 1kHz for one percent THD). It has a quoted sensitivity of -34dB ref 1V/P, and with its A-weighted noise figure of 19dB EIN, the background noise is not untypical for a good-quality microphone of this type, and will certainly not pose a problem in normal studio applications. The M5 isnicely compact, at 100mm long and 20mm in diameter, making it easy to position around awkward instruments. Also, not to be undervalued, the 12-month warranty period is extended to 10 years once you register the product with Rode. My first test was to use a single M5 to record acoustic guitar, the results of which sounded detailed and articulate, with that gentle presence hump bringing out the transients while avoiding harshness or brittleness. At no time did the tonality give away the fact that I was using a budget microphone. Putting up my NT55 (fitted with a cardioid capsule) produced very similar results, though if anything, the NT55 exhibited a slightly more forward character in the highs than did the M5 so, for that particular instrument in that particular room, I actually preferred the sound of the M5, which came as something of a surprise! The two mics are surprisingly close in character though, with no obvious 'tells' to suggest that the M5 is the poor relation. One popular technique for testing a mic's high-frequency response is to record a set of jangling keys, as that sound contains a lot of HF (and even ultrasonic) energy. As an alternative to that, though, I recorded a set of miniature bells (also rich in high frequencies), which in my case was a little more scientific as several of my keys have plastic fobs! Neither the NT55 nor the M5 seemed unduly upset, however, and both gave a good impression of the bells as heard in the room with minimal intermodulation artifacts. As a stereo pair the mics are also very effective, and well matched in sensitivity. They are useful in both spaced and coincident configurations, the low end always sounding tight and controlled. The M5s were very easy to position, as the former are an inch or so shorter than the NT5 and significantly shorter than the NT55. Given their attractive price, the level of performance and that enticingly long warranty, there's little not to like about Rode's new mic. It is a capable general-purpose mic that can handle just about any acoustic instrument source (though it probably wouldn't be my first choice for kick drum), where their ability to sound smooth yet detailed will be appreciated. Most of the familiar names in microphone manufacturing offer small-diaphragm mics, many at a budget price, as with the MXL 606, though the M5's combination of performance, price and warranty surely puts it towards the top end of anyone's shortlist. No plastic storage pouch or box included. Whether used singly or in pairs, the M5 offers a serious level of performance at an entry-level price. £169 per matched pair, including VAT.